This week I made sixteen of these cuties and made them into a baby quilt that you’ll see soon. That used three and a half yards, and no new fabric came in. Today I’m putting together a dozen string blocks for Kat’s October block drive. You know me and strings, but it’s also a good cause. Look at what “we” made with August’s flying geese blocks! She gave us the color scheme and we all pieced geese, and look how well they went together! I love the way she sashed and quilted it, too. Whether you’re stashing or destashing, I hope you’re having success. I’m linking up to Judy’s report at Patchwork Times. 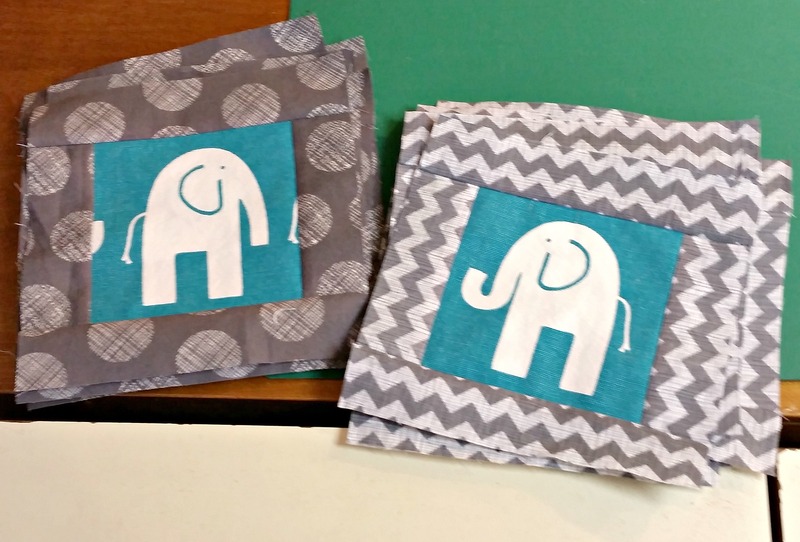 Those little elephant blocks are adorable, Valerie! Can’t wait to see the finished quilt, a gift perhaps? I actually visited those links (proud of me?) provided, and have to say the flying geese quilt came out awesome! What a great cause! I signed up for October. I’ve never seen her blog before, thanks for linking it in!